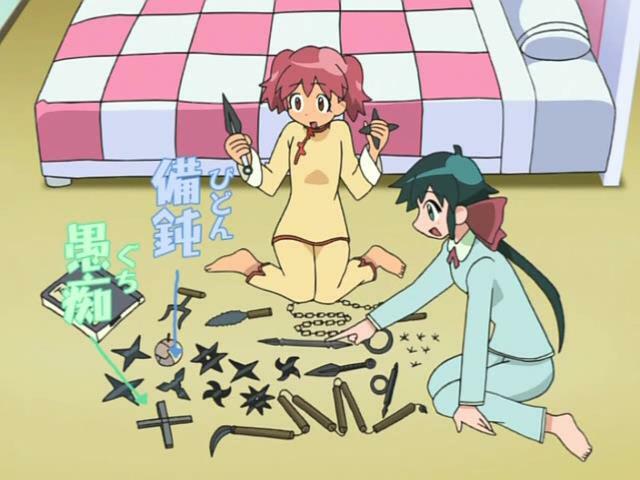 Natsumi invites Koyuki over for a pajama party. Though Koyuki misunderstood what pajama party meant, she did bring a lot of “snacks” (lizards and things) from her village. She also shows off her shinobi gear. Meanwhile, Keroro is happy to have his Guntank Gunpla model back while Giroro steams in jealousy. 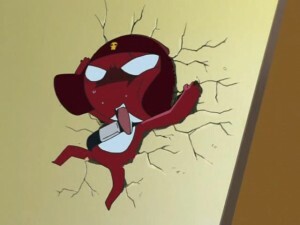 Giroro gets caught eavesdropping by Natsumi and is thrown out of the house. Hearing Koyuki and Natsumi speak of the A-B-C’s of their relationship has Giroro over the edge, forcing Dororo to reveal himself and stop Giroro. Keroro comes into the middle of the battle and loses it when his newly made Guntank is destroy. As the three battle. 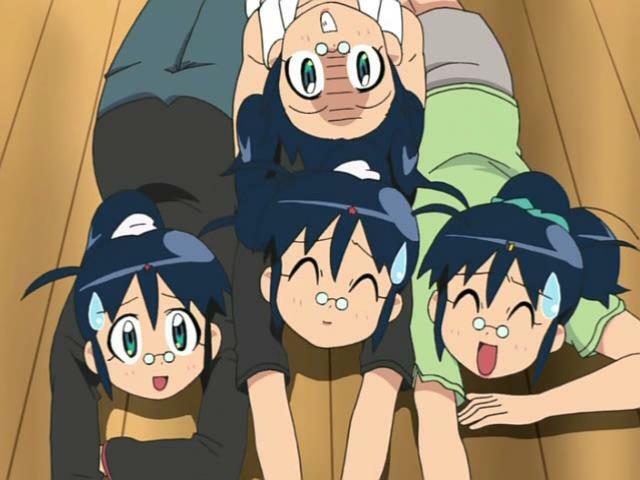 Natsumi and Koyuki have a bath together, then go to bed; Koyuki sleeps on the ceiling facing Natsumi. The next morning, Koyuki, Natsumi, and Fuyuki discover Keroro, Giroro, and Dororo knocked out in the remains of their battle. Aki is delayed by work from making it home for Natsumi’s teacher’s home visit. Natsumi is fretting about this, so Giroro suggest telling the truth. Natsumi sends Fuyuki to keep the “frogs” out of sight when her teacher comes by. 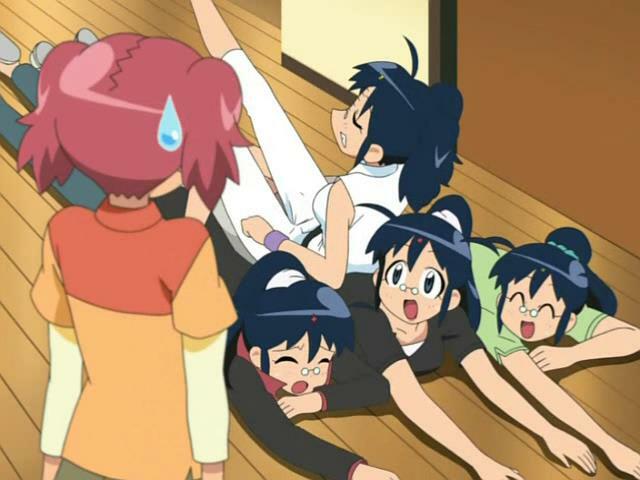 Giroro, in an Aki suit, tries to pretend to be Aki, but Natsumi has him thrown into the basement, apologizing to her sensei for the old woman relative she just met. Natsumi is about to tell the truth when Dororo is there, also in an Aki suit. 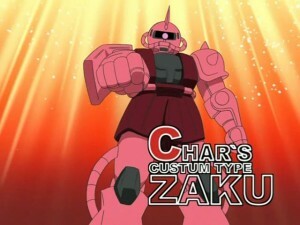 Natsumi sends him packing, but then Tamama shows up in an Aki suit. Natsumi ushers Sensei away, but then Kururu shows up in an Aki suit. Natsumi shoves him out, but when Kururu says that the coffee he has would make things more interesting if Sensei drank it, Natsumi throws him through a window. Returning to Sensei, Natsumi apologizes and again tries to tell the truth. 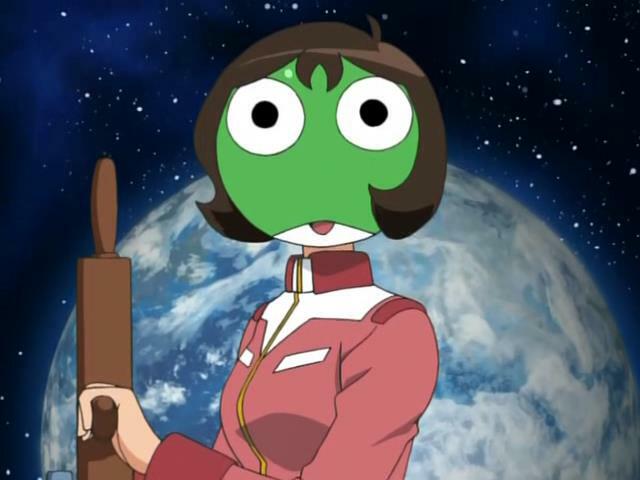 Keroro shows up in a human suit, dressed as Frau Bow from Mobile Suit Gundam, again claiming to be Natsumi’s mother. Giroro thinks he’ll be praised for cosplaying a mother on White Base, but he too is thrown out a window. A frustrated Keroro laments his good intentions not reaching Natsumi, so Kururu suggests a transformation. Using ninjitsu arts, Dororo creates the illusion that they are all Aki. A disagreement among them causes them to fight. Their fight brings out Natsumi’s rage as the real Aki comes home. 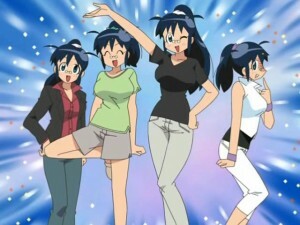 Sensei assumes the other Aki’s are Aki’s sister, so Natsumi lets them off. 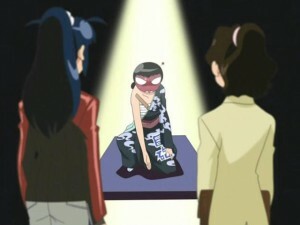 However, Aki and Sensei are in for a surprise when Giroro attempts to be Aki in a female yakuza (?) outfit. Two stories again, one “meh” with lots of Gundam references (complete with Engrish) and one outrageously funny, also with Gundam references. Koyuki not understanding what a pajama party is and her whacked choice of snacks was boring. After all, how long has Koyuki been living in the real world and yet is still oblivious to everything? Giroro’s jealousy (and resulting punishment) was also “meh” because it was a “been there, done that” thing. For the second story, while the premise was old (the platoon impersonating someone), there was just something outrageously funny about seeing Keroro, Dororo, Tamama, and even Kururu in Aki disguises, desperately trying to pretend to be Aki. I just laughed and laughed, something I don’t normally do for Keroro Gunsou episodes. In the end, an episode that was pretty good, only because of the second story in the episode.